A good message requires effective means of delivering it. We at Elijah are always on the lookout for means of disseminating the work of our scholars and leaders to the broader public. 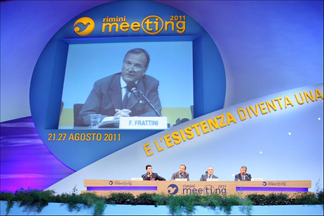 In this context, we are delighted to share with our readers a developing partnership with the Rimini Meeting. Rimini (http://www.meetingrimini.org/eng/) is probably the largest gathering of individuals for purposes of study and enrichment, worldwide. Started by the Catholic group ‘Communion and Liberation’ over thirty years ago, it brings together individuals from all fields, walks of life and countries to a meeting of friendship between peoples. About one hundred thousand people attend this annual meeting, where issues of religion and theology, along with culture, art, literature, music, sports and more are featured. Elijah has a special contribution to make in the field of interreligious dialogue and partnership with the Meeting is promising for the common goals of both organizations. Elijah’s director has taken part in the meeting for the past two years, in preparation for long term collaboration. This year a public dialogue was held with Fr. Ambrogio Pisoni. The dialogue, attended by several hundred listeners, focused on the question of religious experience in Judaism and Christianity. This has emerged as a domain in which future collaboration can take place. Founding Elijah followed many years of close association with friends of other religions. The experiences and lessons gained from those relationships provided the ground upon which the vision of Elijah grew. One of the most important relationships that preceded Elijah’s foundation, which was then carried over into a collaboration within Elijah, was my friendship with the Chicago based Jesuit, Franz Jozef van Beeck. We first met in 1991, at a theology conference organized by the Shalom Hartman Institute. Our connection was immediate, and it led to many years of personal and theological sharing. As Cardinal Cody professor of theology at Loyola University, Joep invited me to address the theology department. As a friend, he taught me important lessons of how to integrate my humanity and my spirituality. He was deeply human and deeply spiritual, in complex and enriching ways. As Elijah was conceived, he helped me to work through many of the ideas that formed the vision, and continued to serve on our advisory board. I remember in particular his emphasis that teachers at Elijah should share their personal practice and lived spirituality with students, so that their teaching is not abstract or divorced from their personal spiritual reality. That this fact should stick out is itself a sign of what was important for him. What is happening to us, I suggest, is that the great religions are at last beginning to find it within themselves not only to affect other great religions, that has happened a lot, often with a vengeance, but also (and especially) to let themselves be affected by them. Are the mixed-up fortunes of past history really turning into today’s moral agenda? Is fated encounter at last occasioning human encounter? And will this encounter beget Peace or War? My answer is provisional. It may lead to Peace, if only we can stop living our religions politically and instead, let ourselves be fed at the wellsprings of repentance within each of our religions. Why repentance? Because it is the only way to create something new and gracious out of our centuries-old history of blaming and meting out punishment to each other. Finally, mention should be made of his own theological reflections, based upon the famous pseudo Warsaw ghetto work of Yosele Rakover and Emmanuel Levinas’ eventual development of themes from this work. These inspired Joep to author “Loving the Torah More than God: Towards A Catholic Appreciation of Judaism, (Loyola University Press, 1989). I went to say goodbye to Joep, on September 1st, shortly before he passed away. We both knew it was the last time we would see each other. We also knew that the next time we meet would be in heaven. In 1988 Joep gave the Fourth Annual John Cardinal Cody Lectures. These were published the next year as a book entitled Loving the Torah More Than God: Towards a Catholic Appreciation of Judaism. ..By treating the subject matter of this book, however, I acknowledge that I do not have only theological reasons for choosing [Zvi Kolitz’ story and] Emmanuel Levinas’ commentary.I have personal ones too. When I first read these modern Jewish writings, they revived deep and lasting memories in myself, memories from the days when I was an eleven and twelve year old boy in The Hague, in The Netherlands: the embarrassing sight of the yellow stars below the left lapels of the overcoats of sad, fearful, and unspeakably distant-looking people in the streets in the early war years; the anti-Jewish slogans on billboards and the reports on anti-Jewish measures in newspapers; the swift, menacing arrests and deportations of silent, seemingly uncomplaining Jewish men, women, and children in our streets. Most painfully of all, at least for me personally, I recall the dreadful late afternoon of Wednesday, November 25, 1942, when, as a boy of twelve, a few days before my father’s birthday, I walked back home in tears, having found the front door of the house of the kindly old gentleman who was my violin teacher secured by means of a seal whose significance we had come to understand only too well. His name was Samuel Schuyer. He was the first Jew I was privileged to meet and learn from, and thank God, not the last. ..We have reviewed three dubious developments. It is not difficult to recognize in them three principal causes of friction between Christianity and Judaism, all of them pointed out and criticized by Levinas. The first—Christianity’s status as an established religion— accounts for the fact that the Christian concept of fulfilment got misinterpreted as displacement of Judaism. The second—dependency as a widespread characteristic of the Christian style of believing—accounts for the prominence of the salvation theme in Christian believing, at the expense of the theme of moral responsibility for humanity in the world. The third—salvation by substitutionary Atonement—accounts for the tendency, excoriated by Levinas, to mystify suffering and thus justify it. From the point of view of Christian, Catholic theology, and in the name of the gospel and the great Tradition of the undivided Christian Church, we have to say that on all three counts, the type of Christian faith that Levinas rejects is one that deserves to be rejected. In demanding (1) that Judaism be respected in its own integrity, (2) that faith in God be construed, not as an assurance of divine indulgence to comfort the immature, but as a divine call to disciplined maturity, and (3) that the suffering of the innocent not be mystified and thus justified, Levinas is simply asking Christians to be true to their own deepest tradition.